All data is self-reported by the drilling operators to the DEP. Non-Marcellus Shale wells in Pennsylvania reported production of gas, oil, and condensate in 2010. Gas is reported in thousands of cubic feet (Mcf), while production values for oil and condensate are reported in barrels. Natural gas production in the state is significant, even without the prodigious Marcellus Shale formation that dominates current drilling activity. Production values vary widely throughout Pennsylvania, which of course feeds into how much royalty a landowner could make off a well on his or her property. Based on the $4.16 average wellhead price of gas for 2010, a well would have needed to produce about 1,924 Mcf of gas in order to collect $1,000, assuming the minimum one eighth share required by Pennsylvania. 36,062 of the producing wells in Pennsylvania produced that amount or less, and 28,616 earned more than that figure. The most productive non Marcellus Shale well produced 1,049,000 Mcf, which would produed a royalty check of over $540,000. The least productive wells would not qualify for any royalty check. 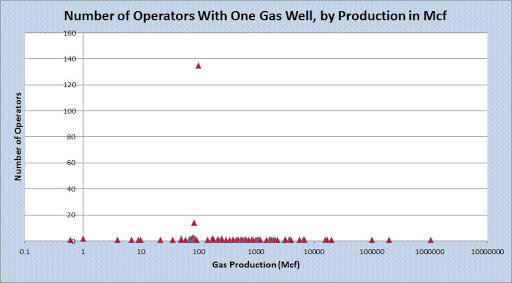 There are some non Marcellus gas wells that are drilled horizontally now, and they are on average five times more productive than their vertical counterparts, although the sample size is fairly small. The last column, “TX Severance” calculates the estimated severance tax that would have been collected on the gas produced from Pennsylvania’s non Marcellus Shale wells, if the Commonwealth had the same 7.5 percent severance tax as Texas. 135 of 256 operators with just one well reported exactly 100 Mcf produced in 2010. Since there is no severance tax in Pennsylvania, the most important reason to get production values correct is to make sure the landowner gets the proper royalty check. However, there are a 2,617 wells that are identified as home wells, and for these wells, royalty payments wouldn’t apply either, since the operator and the resident are the same person. Many of these wells are unmetered, according to the notes in the dataset. This probably explains why a large number of operators with just one well reported exactly 100 Mcf. Non Marcellus Shale wells in Pennsylvania also produced oil and condensate. Condensate is a hydrocarbon liquid or gas (depending on conditions) that is often associated with “wet gas” wells. Through the control of temperature and pressure, this is turned into liquid, removed from the natural gas stream, and sold to oil refineries. Although counted separately, condensate is fundamentally similar to light crude oil, and it is relatively easy to process into gasoline and other fuels. The average price per barrel for petroleum and other liquids in 2010 was $79.61. Production summaries and market estimates for oil and condensate from non Marcellus Shale wells in Pennsylvania in 2010. If Pennsylvania had the same 4.6 percent severance tax as Texas, we would have collected about $9.5 million in revenues. Combined with hypothetical gas revenues discussed above, Pennsylvania would have a handy $72.5 million to help fill in the budget gaps, just from the non Marcellus Shale wells. Basic Sediment. This is composed of salt and other impurities that often settle at the bottom of the tank. No basic sediment was reported in Pennsylvania for non Marcellus Shale wells in 2010. Brine. I contacted the DEP in February to clear up a point about brine for Marcellus wells. The amount of brine and frac fluid were nearly the same. Usually, “frac fluid” refers to the 1% or so of chemical fluids that are added to the sand and millions of gallons of water in order to hydraulically fracture oil and gas wells. Brine is usually one of several terms that describe this mixture once it flows back up to the surface after fracturing, having acquired significant salinity along the way. I was told that in this case, brine referred to natural underground salty waters that were encountered in the drilling process, and that frac fluid was the flow back water after fracturing operations had begun. On the other hand, I have spoken with reporters who have learned from industry sources that they treat the distinction differently: flow back water in the first 30 days are so are considered “frac fluid”, and anything thereafter is “brine”. Regardless of how the distinction is used in practice, both are wastewater types that are difficult to dispose of. There is a movement in the industry to recycle as much as possible of these fluids for future wells. In April, the DEP asked drillers to stop disposing of these fluids in treatment plants that ultimately put the diluted fluid back into our rivers and streams. Recently, some progress has been made in those regards. Another common disposal method is the use of underground injection wells. 40,731 non Marcellus wells reported brine wastewater production in Pennsylvania in 2010, with amounts ranging from 0 to 105,000 barrels. 33,153 wells (81 percent) reported amounts of 100 barrels or less. Statewide, 4,452,905 barrels of brine were reported in 2010 for non Marcellus Shale wells, or about 187 million gallons. Drill Cutting. Of the thousands of non Marcellus Shale wells drilled last year, apparently only one company encountered drill cuttings. 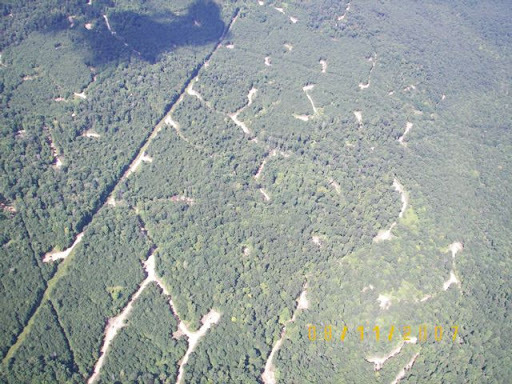 Newfield Appalachia PA, LLC reported three Wayne County wells that created this type of waste that is created when the drill bit chews up thousands of feet of subterranean rock and sediment en route to the target formation. There is no word on how the other companies avoided creating drill cuttings, but in my opinion, Newfield deserves some praise for taking their reporting obligations seriously. Drill cutting waste ranged from 25 tons to 506 tons, with two wells (67 percent) reporting less than 100 tons. Drilling Fluid. According to OSHA, there are several functions for drilling fluid, including maintaining a proper well pressure, keeping the drill bit cool, removing the drill cuttings, and preventing a collapse of the well before it has been cased. 836 wells reported drilling fluid waste, 580 of which (69 percent)reported values of under 100 barrels. The largest quantity was 45,360 barrels, an amount large enough to possibly include drill cuttings as well. Frac Fluid For more information, see the comments for brine, above. 2,805 wells reported frac fluid waste produciton, with quantities ranging from 0 to 54,600 barrels. 2,330 wells (83 percent) reported production of less than 100 barrels of frac fluid. Statewide, there were 499,351 barrels reported, or about 22.9 million gallons. A legal plan to control drilling What if Pennsylvania Had the Same Severance Tax as Texas?